Earlier this week, the Department of Defense issued new guidance to contracting officers on how to implement the CAS Board's (Cost Accounting Standards Board) new rules for projecting pension costs in forward pricing proposals. The new rules cover defined benefit pension plans covered by CAS 412 and 413. The rules also apply to non-CAS covered contracts since FAR 31.205-6(j) requires the use of CAS 412 and 413 to measure, assign, and allocate allowable pension costs. This new guidance affects contracts awarded after February 27, 2012. The number of contractors with defined benefit pension plans is relatively small and getting smaller all of the time. But if your company has one (and you allocate pension costs to Government contracts), you need to read and comply with the new guidance. Today we will conclude this four part series on prime contractor responsibilities when it comes to subcontracting and administering those subcontracts. We have addressed only a few of those obligations but the ones we have discussed are the ones that have monetary consequences when contractors fail to take those responsibilities seriously. Contractors are responsible for performing or having performed all inspections and tests necessary to substantiate that the supplies or services furnished under their contract conform to contract requirements, including any applicable technical requirements for specified manufacturers' parts. These pertinent clauses are found in 52-246-1 through 14 depending upon type of contract and what is being purchased. These clauses also give the Government the right to inspect the goods and services being purchased prior to delivery or contract completion. The inspection clause protects the Government by allowing it time to spot and correct defects or flaws before completion. It also protects the contractor because sometimes the Government will try to alter standards to a higher level than that spelled out in the contract. Quality testing can take on many different forms but the most common attributes tested are quality, quantity, and timeliness. When the Government performs inspections and tests, it must do so in a manner that will not unduly delay the work. However, whether the Government chooses to perform testing or not, the contractor is never absolved from meeting the quality standards specified in the contract. Just as the Government conducts inspections and testing at the prime contract level, the prime contractor must conduct similar inspections and testing at the subcontract level. Failure to do for example could introduce non-conforming parts into the supply chain. The Government has pursued many cases where companies falsely represented parts as meeting contract specifications. In some cases, the Government may also want to conduct quality assurance testing on subcontracted supplies and services when it is in their interest. For example, if the item produced by a subcontractor is to be shipped directly to the end user, it would be in the Government's interest to conduct testing at the subcontractor. Just because the Government steps in and conducts testing/inspections at the subcontractor, the prime contractor is not relieved of any of its responsibilities under the contract. Today we are continuing our series on prime contractor responsibilities toward their subcontractors. After learning that Lockheed Martin paid out $15.8 million to settle a civil suit brought by the Government because its oversight was found to be lacking, we thought it would be beneficial to discuss those responsibilities. Yesterday we focused on making certain that the proper clauses (the flowdown clauses) were included in the subcontract document. Today we will discuss prime contractor responsibility concerning the propriety of subcontractor billings. A contractor's (or higher tier subcontractor's) primary responsibility with respect to billings from subcontractors is to ensure that those billings are prepared in accordance with subcontract terms and conditions. Depending on the type of subcontract, there could be cost-reimbursement vouchers, progress payments based on costs, performance based payments, or simply traditional invoices. The level of prime contractor oversight required is greatest for cost-reimbursable vouchers and less for simple invoices. For cost-reimbursable subcontracts, prime contractors must ensure that subcontractors have accounting systems that can accommodate billings under those types of contracts. This would include the capability of accumulating costs by contract, calculating and monitoring indirect rates and adjusting them when necessary, applying those rates to the appropriate base costs, reporting no less than monthly, advising the prime contractor when certain thresholds are met (limitation of funds), and more. For progress payments based on costs, the prime contractor must ensure the propriety of incurred costs and also calculate for potential subcontract "losses". For performance-based payments, the prime contractor must ensure that the subcontractor has the capability of determining when milestones are met or achieved. The worst thing a prime contractor can do is make payments to subcontractors without ever performing any level of review. Such reviews need not be performed for each and every billing. The prime contractor might decide to review subcontractor billing systems to gain the confidence and assurance that the system can produce accurate billing statements. Once a system is determined adequate, prime contractors can reduce testing to periodic levels. The risk to prime contractors (and ultimately the Government) is the potential for subcontractors to bill costs prior to their incurrence or prior to when they should according to the terms of the subcontract. Excessive provisional billing rates is one method of obtaining reimbursement for costs not incurred. Milestone payments is another area that can be abused if payment percentages (or amounts) are disproportional to the level of work accomplished. When an indication of impropriety came to Lockheed's attention, it did not sufficiently follow up on the information. Broadly speaking, prime contractors should administer their subcontracts similar to the manner in which the Government administers its prime contracts. The methods will not be the same but the basic concepts regarding subcontract administration should be similar to the way the Government works. These concepts vary depending on type of contract/subcontract (e.g. CPFF, FFP, T&M) and size. Generally, cost-reimbursable contracts requires more oversight than do firm-fixed price contracts. Our focus in these next few blogs will be prime contractor responsibilities after subcontract award, particularly awards of cost-reimbursable subcontracts. Keep in mind that activities leading up to subcontract award are just as important as post-award actions. In fact, the Government has specialized teams that review contracting purchasing systems which include elements of subcontracting. The word "flowdown" refers to the practice of obtaining a certification or representation from a prospective subcontractor that was first required of the prime contractor including the actual text of the "substance" of all or part of a Government prime contract clause in a subcontract and requiring something of a subcontractor that the Government requires of the prime. First and foremost, prime contractors must ensure that all required flowdown requirements/clauses are included in the subcontract. There are two types of flowdown requirements; mandatory and essential. Mandatory flowdown requirements are those expressed in the texts of provisions and clauses. Numerous FAR provisions and clauses contain such mandatory flowdown requirements. By entering into a prime contract that includes mandatory flowdown clauses a prime contractor promises the Government that it will include the clauses in its subcontracts. Failure to do so would be a breach of contract. Essential flowdown requirements are those that the Government does not require the prime contractor to flow down, but that the prime contractor must include in its subcontracts in order to be able to fulfill its obligations to the Government. Ensuring that the proper clauses are included in subcontracts is not an easy task. It requires a careful reading of the clauses in the prime contract. There are (by one account) potentially 88 different clauses that could be flowed down to a subcontract, depending on circumstances. We've seen some contractors flow down all the clauses from their prime contract whether they are relevant or not. That may be safe but it often leaves subcontractors scratching their heads trying to figure out what clauses mean and how they apply. There are practice aids available to purchase that can help contractors sort out the flowdown requirements. Tools and Metals Inc. (TMI) was a subcontractor to Lockheed Martin on several aircraft programs. TMI produced perishable tools and sold them to Lockheed for use on military aircraft including the F-22 and F-35 fighter jets. TMI inflated the costs of these tools for seven years before the Government caught on to the scheme. During this time, Lockheed passed the inflated costs on to the United States Government under various prime contracts. The president of TMI ultimately plead guilty and was sentenced to prison for seven years. But that is not the end of the story. The Federal Government then brought civil claims against Lockheed under the False Claims Act alleging that Lockheed contributed to the inflated amounts paid by the United States in connection with TMI's pricing scheme. Specifically, the government alleged that Lockheed acted "recklessly" by failing to adequately oversee TMI's charging practices and by mishandling information revealing these practices. Last week, Lockheed agreed to pay $15.8 million to settle these allegations. In announcing the settlement, the Department of Justice stated "It is troubling that a large defense contractor with long-established contractual ties with the United States failed to undertake appropriate measures to ensure the integrity and validity of the costs is submitted to the United States.."
What are those"appropriate measures" that DoJ talked about? We are going to take the next few days to explore exactly what is required by prime contractors in administering its subcontracts. This was a painful lesson for Lockheed. Don't make the same mistakes. Earlier this week, the House Armed Services Committee's Panel on Business Challenges Within the Defense Industry released their report "Challenges to Doing business with the Department of Defense". This report represents the culmination of six months of work examining the challenges that businesses face when working with the Department of Defense. The Panel met with or heard testimony from more than 150 people from around the country representing government, industry, think tanks, and academia. The Panel's Chairman, Congressman Shuster stated; "Across the country, we heard the same thing from businesses, academics and researchers: navigating the defense acquisitions process is difficult for all businesses but is particularly difficult for small businesses". Requiring the Secretary of Defense, in coordination with the Service Secretaries, to develop a long-term strategy for maintaining a robust and effective defense industrial base. Requiring the Secretary of Defense to develop policies and mechanisms to improve communication with industry to better enable industry to allocate independent R&D resources and make investments to meet the future needs of the Department. Ensuring that work being reserved for small business performance is actually performed by small businesses. Continuing to rebuild the breadth and depth of the defense acquisition workforce which will, in all likelihood, save money and improve acquisition outcomes. Simplifying and streamlining the acquisition process by conducting a comprehensive review of the laws and regulations that govern the acquisition process in order to repeal or amend regulations that are outdated or have had unintended consequences that outweigh the original intent of the regulation. Here's a "heads-up" for contractors when authorizing administrative leave due to inclement weather. Most companies would believe that sending employees home or advising them to stay home when inclement weather threatens is the wise thing to do. However, don't be surprised if the Government tries to second-guess your decision and question some costs. According to current guidance being disseminated to Government auditors, the allowability and allocability of paid administrative leave due to inclement weather must be evaluated on a case-by-case basis in accordance with FAR 31.205-6 (the Compensation cost principle). Paid absences are allowable to the extent that they are reasonable in nature and in amount and are required by law, employer-employee agreement, or an established policy of the contractor. The issue that auditors are being told to consider is not the reasonableness of the amount paid but whether or not the circumstances warranted the payment of administrative leave. Based on these subjective tests, the auditor will assess the reasonableness of the costs. If the costs are determined to be allowable, they should be charged in accordance with the contractor's disclosed or established cost accounting practice for charging paid absences. Contractors should think about these things before inclement whether (or other natural disasters) threaten. It would probably be update applicable policies and procedures to ensure that any decisions affecting administrative leave are made at the appropriate level and documented. A recent bid protest decision handed down by the Government Accountability Office (GAO) illustrates the legal differences between an "offer" and a "quotation" (see B-405711.2 dated March 19, 2012). An offer, when accepted by the Government, is immediately binding on both parties whereas a quotation is not binding until accepted by the contractor. In this case, the Navy issued an RFQ (Request for Quotation) to buy some shipping containers. There were several bidders. One of the unsuccessful bidders protested the award because the Navy had not properly evaluated its offer. In its defense, the Navy took the position that the appellant was not an "interested party" because its quotation had expired. The Navy was hanging its hat on a technicality the quotation failed to specify that its price would be held firm for 90 days as requested by the RFQ. GAO disagreed because the solicitation document was an RFQ, not an RFP. We do not agree with the agency that the "expiration" of (the) quotation rendered the quotation unacceptable. We recognize that, in practice, agencies and vendors often treat quotations as if they were offers. Nonetheless, as a matter of law, quotations are different from bids or offers. The submission of a bid or proposal constitutes, by its very nature, an offer by a contractor that, if accepted, creates a binding legal obligation n both parties. Because of the binding nature of bids and offers, they are held open for acceptance within a specified or reasonable period of time, and our case law has necessarily developed rules regarding the government's acceptance of "expired" bids or proposals. A quotation, on the other hand, is not a submission for acceptance by the government to form a binding contract; rather, vendor quotations are purely informational. In the RFQ context, it is the government that makes the offer, albeit generally based on the information provided by the vendor in its quotation, and no binding agreement is created until the vendor accepts the offer. A vendor submitting a price quotation therefore could, the next moment, reject an offer from the government at its quoted price. Because endors in the RFQ context hold the power of acceptance and their submissions are purely informational, there is nothing for vendors to hold open. Thus, we have not applied the acceptance period concept or the attendant rules regarding expiration of bids or offers to RFQs. It is possible for a single contract issue to be noncompliant with both the Federal Acquisition Regulations (FAR) and similar provisions in the Cost Accounting Standards (CAS). For example costs dealing with pensions (CAS 412 and 413), insurance (CAS 415), and Independent Research and Development (CAS 420) all have counterparts in FAR. Similarly, the CAS Standard on Accounting for Unallowable Costs (CAS 405) has a parallel in FAR 31.201-6, Accounting for Unallowable Costs. The Government will always process noncompliances that violate both FAR and similar provisions in CAS, as CAS noncompliances under the Cost Accounting Standards clause 52.230-2(a)(5). This clause requires contractors to (i) correct the noncompliant practice, (ii) to pay the Government back for any resulting cost impact, and (iii) pay the Government interest on any overpayment that resulted from the noncompliance. CAS is tougher than FAR when noncompliances are disclosed. A FAR noncompliance does not require corrective actions nor does it allow the Government to recover interest on any overpayments that resulted from the noncompliance (although penalties for unallowable costs may apply). Last Thursday, March 15th, Senator's Boxer and Grassley introduced a bill in the Senate to limit allowable compensation for any contractor or subcontractor employee to that of the President of the United States. Currently, the President's compensation is set at $400 thousand. This would represent a significant reduction from the current cap of nearly $700 thousand. As Senator Grassley and I made clear in December, we will keep fighting to rein in exorbitant taxpayer-funded salaries for contractors. There is simply no reason that taxpayers should fund government reimbursements for private contractor salaries at a rate more than three times what Cabinet Secretaries earn. "Compensation" in this context means the total amount of wages, salary, bonuses, deferred compensation and employer contributions to defined contribution pension plans. Although $400 thousand is still a lot of money, many more contractors (and subcontractors) are going to be impacted than are currently impacted by the $700 thousand compensation cap. The lower cap, if implemented, will increase the level of Government oversight in the near term and prime contractors will need to implement controls to ensure that their subcontractors are not passing along excess compensation costs. Back in August 2010, we posted comments on the Government's quick close-out procedures for completed contracts. This program allows the Government to negotiate the settlement of direct and indirect costs for a specific contract, task order, or delivery order in advance of the determination of the final direct and indirect costs (i.e. the DCAA audit) when certain criteria are met. You can read that posting here. Since that posting, the criteria for eligibility has changed (or, as the Government says, "enhanced") to broaden its applicability. Under the old criteria, the eligibility rules, total "unsettled" direct and indirect costs had to total less than $1 million and unsettled indirect costs couldn't exceed 15% of the estimated total indirect costs allocable to all cost-type contracts for that year. 10% of the contract amount. They key here is that now, each contract stands on its own. Contractors do not need to perform the detailed analysis to determine whether indirect costs applicable to the contract exceed 15% of the indirect costs allocable to all cost-type contracts. Under the old rules, contractors with only one cost-type contract could never quick-close a contract because the indirect costs allocable to that contract would always exceed 15%. If you have contracts that meet this criteria, you should ask your contracting officer to initiate quick-close procedures. You'll receive final payment that much quicker. The FAR cost principle addressing bad debts (FAR 31.205-3) is very brief. It states that bad debts, including actual or estimated losses arising from uncollectible accounts receivable due from customers and other claims, and any directly associated cost such as collection costs, and legal costs are unallowable. This basic provision has been around since 1942. Since the Government always pays its bills, bad debts only arise from non-government transactions and therefore are not allocable to Government work (or so the theory goes - some contractors will tell you that the Government doesn't always pay its bills). The tricky part of this cost principle concerns "directly associated costs". It states that bad debts and directly associated costs (such as collection and legal) are unallowable. Auditors will attempt to question or disallow all collection efforts, even those efforts that ultimately result in collection. But that is not what the cost principle states. It makes cost of collection efforts unallowable only if the underlying debt is ultimately unallowable. The cost of collecting debts that are ultimately paid are allowable. This distinction between bad debts and debts that are ultimately collected was confirmed in an ASBCA (Armed Services Board of Contract Appeals) case from 1965 where the Board rejected the Government's argument that collection costs were unallowable when there was "not the slightest evidence that the collection expense was incurred with respect to bad debts." The Defense Acquisition University (DAU) provides formal classroom courses and continuous learning modules to help the Defense acquisition workforce develop and manage acquisition programs, projects, and systems. The University operates and offers formal classroom courses out of several regional locations but also offers courses on-line (continuous learning environment). These courses cover the full range of contract management including cost analysis, EVMS, FAR, rates, terminations, market research, indirect costs, to name a very few. The courses, including the on-line course are generally restricted to Government personnel. 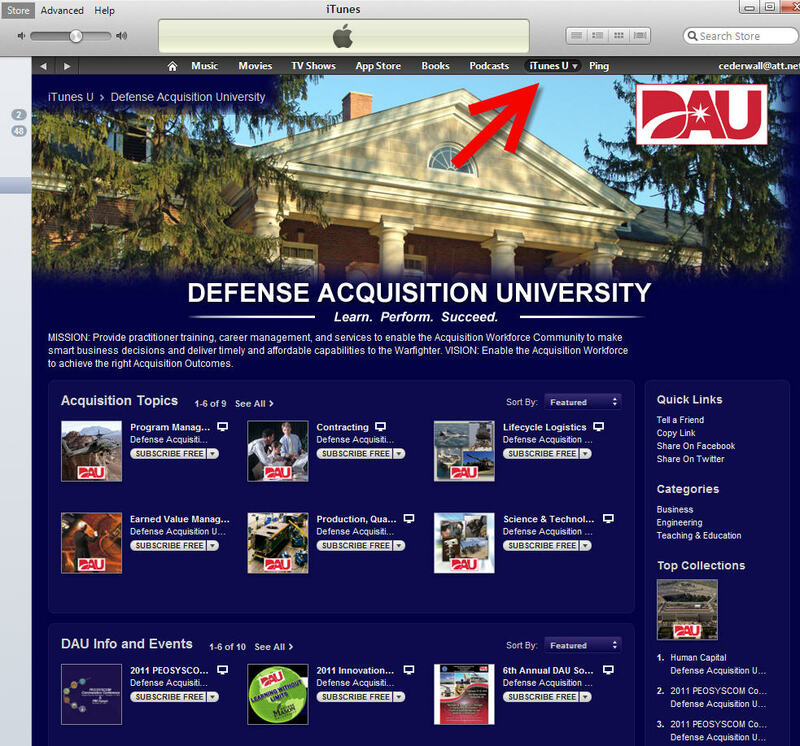 However, some of DAU's offerings are now available through iTunes University. 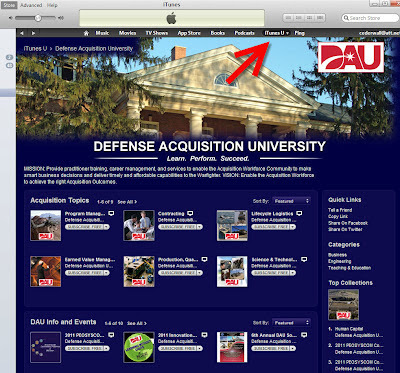 To get there, open the iTunes Store and search for "Defense Acquisition University" or drill down through the menu system. There are about 40 offerings at present with plans to add more. All of them are free. The materials posted to iTunes University by DAU are not comprehensive in nature although we found a couple of nuggets; one on EVMS which provides good overview of what is required and another on COR (Contracting Officer Representative) duties and functions. Many of them are too narrowly focused to be useful for generalized training needs. Also, audio and video quality are not the greatest. So, the next time you travel, load up your iPod/iPad with some DAU training material and redeem some of the "downtime". It seems that everyone wants to produce their own version of a proposal adequacy checklist. Late last year, we reported on DoD's proposed regulation that will add a proposal checklist to its FAR Supplement. Shortly after that, we reported on DCAA's (Defense Contract Audit Agency) revised proposal adequacy checklist. AS we noted, there wasn't a whole lot of difference between the two and probably nothing that would be considered substantive. It recently came to our attention that DCMA (Defense Contract Management Agency) has its own version of a proposal adequacy checklist. Again, there are a lot of similarities between this version and the one published as a proposed regulation. The DCMA checklist has two things going for it that make it a worthwhile investment for contractors to utilize when preparing and submitting price proposals to the Government. It includes comments and explanations for some of the checklist items as a means of clarifying the question and its purpose and intent. It is the checklist that DCMA uses to assess the adequacy of a proposal. As regular readers of this blog know, the responsibility for reviewing the bulk of contractor proposals (everything under $10 firm fixed price and under $100 million cost reimbursable) was shifted from DCAA to DCMA. These checklists are for sole-source procurement where cost or pricing data is required. We don't have a sufficient data set to fully understand what happens when a proposal fails in one or more checklist elements. It could depend on the severity of the deficiency the exercise of sound judgment on the part of the individual performing the adequacy review. In some cases, the Government will simply request prospective contractors to "fix" the inadequacy. In extreme cases, the proposal might be returned for major rework. The FAR cost principle (FAR 31.205-51) on alcoholic beverages is only one sentence long: Cost of alcoholic beverages are unallowable. It was added to FAR in 1986 and until then, the cost of alcoholic beverages was often, if not generally, considered allowable, as long as the costs were also "reasonable". In fact, there was a Board of Contracts Appeals case that specifically ruled the cost of alcohol served at a company picnic was allowable. Despite the brevity and straightforwardness of this cost principle, Government contractors continue to run afoul of the regulation. Usually this happens because contractors do not have adequate policies and procedures in place to identify, screen, and exclude such costs from proposals and billings. One area that auditors like to scrutinize is travel costs because historically they have found that many contractors do not have adequate or effective controls to exclude the cost of alcoholic beverages from travel costs paid directly or reimbursed to employees. It is not uncommon for employees traveling on company business to enjoy an adult beverage with their dinner. Some companies reimburse such costs and then exclude them from billings to the Government. Other contractors specifically prohibit the reimbursement of such costs. Either way, contractors must have adequate internal controls to ensure that such costs are not passed along to the Government. If the costs of alcoholic beverages are found in the history used to forecast indirect rates or in direct or indirect costs billed to the Government, things often get messy. In fact, the time and resources (and penalties) contractors expend to resolve such occurrences are way in excess of any potential damages to the Government. We know of a case where the auditor found a small amount of alcohol costs in an indirect expense pool. The inclusion of the costs did not affect the claimed G&A rate. Yet the auditor questioned the costs, threatened to write the contractor up for internal control deficiencies, recommended the contracting officer assess penalties, and decided the contractor was also in noncompliance with CAS (Cost Accounting Standard) 405 for failing to exclude such costs. In this case, calmer heads (i.e. the contracting officer) stepped in but not before the Government and the contractor expended inordinate time and resources. This could have been avoided altogether if the contractor had had good internal controls in place. For the past few years, the Defense Contract Audit Agency (DCAA) has been living by the old Paul Mason creed - "we will sell no wine before its time". In its quest to produce "perfect" audits, it abandoned its historical roots where providing timely audits was paramount. Much has been written here and elsewhere concerning general contracting officer dissatisfaction with audit timeliness. How useful is a pricing audit that is published after the contract has been awarded? Even after abdicating most of its forward pricing activities (fixed priced contracts under $10 million and cost-type contracts under $100 million) the Agency still had problems in consistently meeting contracting officers' requested due dates. This acknowledges that forward pricing audits play a critical role in the procurement process and failing to provide, as promised, could compromise the negotiation schedule or result in our valuable audit effort not being used to assist in the negotiation of a fair and reasonable price. The performance measure will help DCAA to continually improve our services and processes. (Note the self-promotion in that quote: "...result in our valuable audit effort not being used..."). The guidance goes on to discuss adequate planning, managing workflow, effective risk assessments, and other tools available to the audit team that will assist in meeting the required due dates. It also states that the Agency will begin tracking whether due dates have been met. That brings to mind another adage "What gets measured gets done, what gets measured and fed back gets done well, what gets rewarded gets repeated". Last year, the DoD-IG (Office of the Inspector General) conducted an audit to determine whether DoD contractors that lobbied for and were the recipients of earmarks complied with the requirements of the United States Code and the Federal Acquisition Regulations (FAR) and properly classified lobbying costs as unallowable expenses. The audit report was issued last December and was not released to the public as it was considered "For Official Use Only". A brief of the report was made available on the IG's website and can be viewed here. In the audit, the IG reviewed the accounts of 24 contractors that were the recipients of 50 earmarks, valued at $115 million and found that eighteen of the 24 contractors properly accounted for lobbying costs. The IG found a few minor issues at the remaining six contractors, consisting of $84 thousand where policies were not followed and $258 thousand where the support lacked sufficient detail to determine whether the costs were for lobbying or for some other purpose. As a result of these minor deficiencies, the IG stated that DoD "may" have reimbursed contractors for unallowable lobbying costs but did not come right and state that it in fact happened. Even if all the "suspect" costs were ultimately unallowable, the impact on the Government would have to be factored for the Government's participation percentage in the indirect pools where the costs were booked. Bottom line, contractors are doing a pretty good job in following contracting regulations. The DoD-IG is not the only agency looking for lobbying costs related to earmarks. We've alerted you to DCAA's emphasis a couple of times, most recently here. DCAA has the list of contract awards based on earmarks and has alerted its auditors to specifically look for lobbying costs that are or have been allocated to Government contracts. The procurement policies and procedures of 31.U.S.C. 1352, limitation on use of appropriated funds to influence certain Federal contracting and financial transactions, as implemented in FAR Subpart 3.8, restricts the use of appropriated funds to pay any person to influence or attempt to influence an officer or employee of any agency, a Member of Contress, an officer or employee of Congress, or an emplolyee of a Member of Congress. The FAR requires offerors to furnish a declaration consisting of both a certificatin and a disclosure (see FAR 3.8 and 52.203-11 and -12). There are a number of socioeconomic programs administered by the Small Business Administration (SBA) that provide Government contracting preferences to qualified firms. There is the "8(a)" business development program, the Historically Underutilized Business Zones (HUBZone) Program, the Service-Disabled Veteran-Owned Small Business (SDVOSB) Program, and the Women-Owned Small Business (WOSB) Program for example. Back in 2010, the Small Business Jobs Act of 2010 made it clear that there is no order of precedence among the small business socioeconomic contracting programs. All of these programs are on par with one another. No firm can argue that its socioeconomic standing has preference over another. Contracting officers have the authority to exercise discretion when determining whether an acquisition will be restricted to small businesses participating in these programs but once that decision has been made, all firms in these SBA programs are "socioeconomic equals"
The rules governing these contracting programs are generally located in FAR (Federal Acquisition Regulation) Parts 13 and 19. At the risk of oversimplifying things, acquisitions between $3 thousand and $150 thousand are reserved for small business concerns including 8(a), HUBZone, SDVOSB, and WOSB participants. For acquisitions above $150 thousand, the contracting officer must first consider whether one of the small business socioeconomic programs can do the work. In making such a determination, the contracting officer considers the results of market research that was done to determine if there are socioeconomic firms capable of satisfying the agency's requirements. The Government considers cost-type contracts to be of higher risk than other types of contracts, notably commercial contracts and firm-fixed price. Back in 2009, President Obama set a goal of reducing high-risk contracts and Section 864 of the Duncan Hunter National Defense Authorization Act for fiscal year 2009 required amendments to FAR (Federal Acquisition Regulations) to address the use and management of cost-reimbursement contracts in several areas. Acquisition resources necessary to award and manage a cost-reimbursement contract (it takes more Government resources to administer cost-type contracts than for other types of contracts). An interim rule addressing these areas of focus became finalized in FAR last week. It primarily affects the way the Government chooses contract types and requires more documentation than under the old rules. There is one aspect however that contractors should take note of. A new paragraph was added at FAR 42.302(a)(12) to require that the contracting officer determine the continuing adequacy of the contractor's accounting system during the entire period of contract performance. Under the previous rules, there is no affirmative duty to require contracting officers to regularly monitor the adequacy of contractor accounting systems. The FAR (Federal Acquisition Regulations) Councils finalized a rule last week that it hopes will help Federal agencies achieve the five percent statutory goal for contracting with women-owned small businesses. Under the new rule, agencies may restrict competition to Economically Disadvantaged Women-Owned Small Business (EDWOSB) concerns for certain industries where the SBA has determined that WSOBs are underrepresented in Federal procurement. For industries where women-owned small businesses are not just underrepresented, but substantially underrepresented, agencies may restrict competition to either EDWOSB concerns or to WOSB concerns eligible under the WOSB program. EDWOSB concerns and WOSB concerns eligible under the woman-owned small business program must be owned and controlled by one or more women who are citizens of the United States. We should note that the SBA is starting to crack down on abuses within the context of "controlled". An EDWOSB concern is automatically a WOSB concern eligible under the WOSB program. This rule should help women-owned small businesses and economically disadvantaged woman-owned small businesses in the Federal marketplace. A recent article in the Federal Times is sounding the alarm over the impact that the Pension Protection Act (PPA) of 2006 will have on federal budgets beginning in fiscal year 2013. The lead line states that the rule "...requires the U.S. government to reimburse its contractors to a far greater degree for their employee pension costs". In reality, this statement isn't exactly correct. The PPA (and the subsequent amendment to CAS) allows contractors to close the shortfall between pension liabilities and the amount of funds in pension trusts more quickly than was allowed under the old rules. The Government has always been on the hook for these pension liabilities. The article is accurate in stating that the impact of the rule changes to future budgets is unknown and could potentially be in the billions of dollars. The Lockheed's, Boeing's, and Northrop-Grumman's probably have not "crunched" their numbers yet and most certainly have not impacted forward pricing rates for the change in methodology. In fact, if these companies have a significant backlog of fixed priced effort, it is to their advantage to defer the impact as long as possible. The article also focuses on the DoD and its contractors but the Department of Energy is the real elephant in the room with their huge operation and maintenance contracts at their various sites (Savannah River, Los Alamos, Richland, etc). For the past five decades or so, site support contractors have come and gone but the employees with their lucrative defined benefit pension plans have stayed, donning the hat of whatever contractor is brought in to manage them. Expect to hear a lot about unfunded pension liabilities and their impact on Government budgets in the future. As many of you know, the interim rules on contractor business systems became final last week. There were a few changes made to the interim rules and we will discuss those in a subsequent posting. We didn't see any substantive changes - the rules still apply only to covered DoD contracts. Covered contracts are those subject to CAS (Cost Accounting Standards). Small businesses are exempt from CAS. So are many other types of contracts. All said, these rules will primarily affect the big boys. A respondent stated that DCAA does not have a clean audit opinion on the integrity of the audits they perform; reliance is being placed on an audit agency that must qualify its own audit reports. According to the respondent, the GAO audit reports cited the DCAA for many deficiencies that bring into question the validity of audit reports issued against contractors' business systems. The respondent stated that DCAA should not be viewed as the experts and withholds should not be based on audit reports or audit report quality control systems of questionable validity. The respondent asserted that the Government is attempting to hold contractors to a level of perfection that their own audit agency is unable to maintain. Consequently, the respondent suggested that the audit report should not be used as the sole foundation for a contracting officer's determination of system adequacy, particularly if regulatory withholding of payment will be the result. Well, that's a pretty good question (and no, we were not the ones who posed it). DoD however, sees it a different way. In DoD's view, there is no issue with the qualify of DCAA's audits. The previous peer review assessment of the quality of DCAA's auditing has simply expired and has not yet been updated. Here is DoD's specific response to the question. Currently, DCAA reports for audits performed in accordance with Generally Accepted Government Auditing Standards (GAGAS) must be qualified because the current external opinion has expired. This qualification solely states that the time frame required by GAGAS for an external peer review has expired. Outside of this exception, all of DCAA's audits are being performed in accordance with GAGAS. Furthermore, the objective of the rule is to ensure that contractor business systems provide timely, reliable information for the management of DoD programs. Contracting personnel will make appropriate determinations in accordance with this rule.